I also want to thank our friends at CupcakeMAG for featuring me as one of the moms in their Summer Issue! If you haven’t already seen it, check it out here to the interview & a few more of these photos! Such sweet pictures. I read the article a while back and loved it! 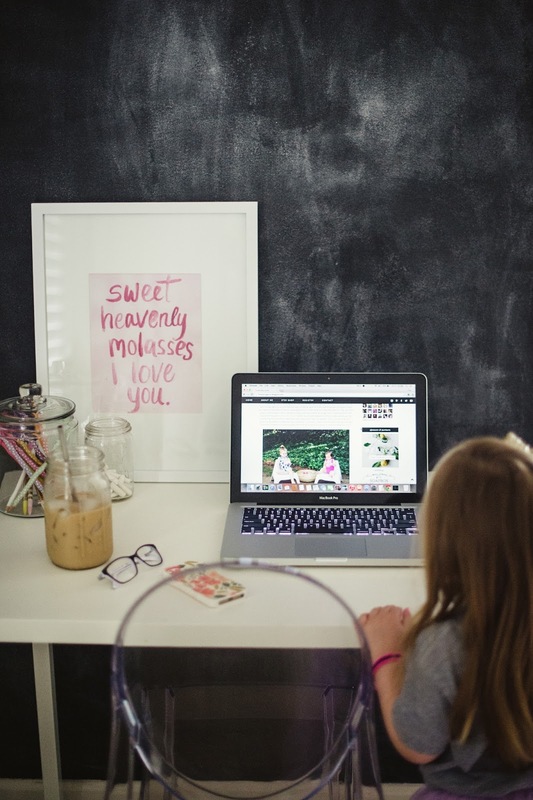 Love these pictures and so awesome to be featured in cupcake mag! Your blog was the first one I followed when we were both pregnant in 2011. Obviously, we all love keeping up with the garvins & following along with you & your mommy adventures & holiday ideas & your easy style! How great for you that your blog has become your job!!! Love! Where do you find all the cute books and plush animals/dolls?! LOVE lifestyle photo shoots! How wonderful you guys got to capture your day to day playing in the playroom! I have a new baby girl as well. She's 5 weeks. I am trying to choose a carrier so I can wear her more often because I also have a busy 3 year old. I have a k tan and love it but its sooo hot! Do you feel like the Solly wrap is cooler than than the k tan? I think I saw at one time you had a k tan. Thanks for your response! I learned about you from Pinterest and have been following you since you were pregnant with Harper. I must say that it has been a treat to follow your journey as I have been coincidentally been along the same ride. My first two children are very close in age with Harper and Eloise, and although you just gave birth to Claire, my third due date is in January. It gives me comfort from time to time to know I am not the only one. Thank you for sharing your world with us. Ha! Definitely a house full of girls. You don't want to see a playroom for my boys! 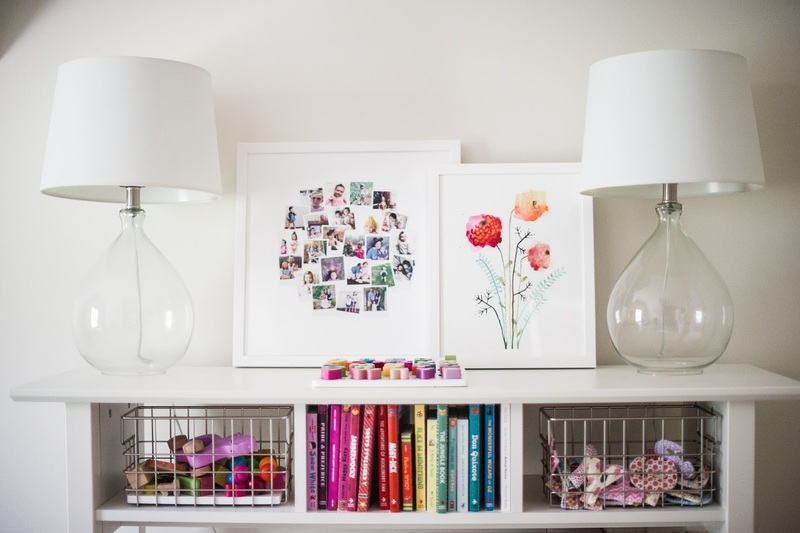 All I could think was those glass lamps wouldn't last a minute in my house….beautiful family. Love that iced coffee made an appearance! These pictures are perfection!! Too cute and so fun to have those pictures to look back on one day! Good grief, you are a DOLL!! Your family is adorable! 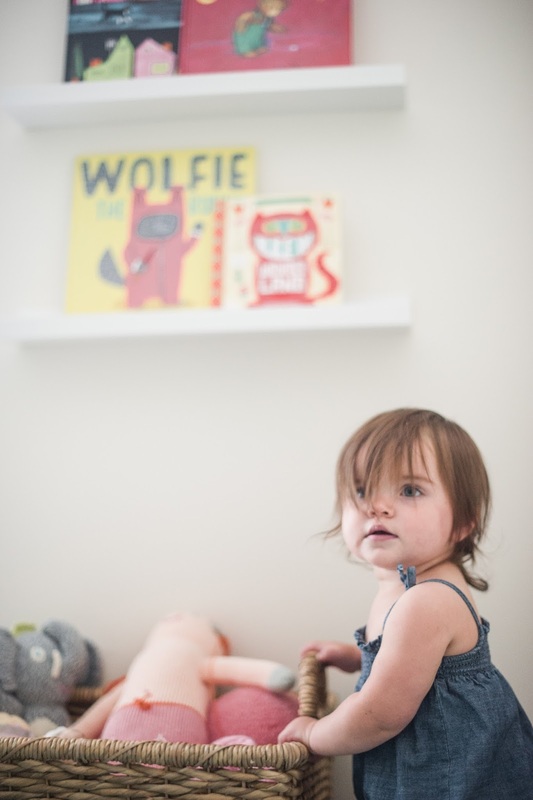 I am seriously just shocked that you were able to do 3 blog posts in a week with a nrwborn! I'm not complaining though. These photos are so neat because they totally show life with kids. I'm loving this style of photo shoot! I never would have thought to layer rugs, totally going to incorporate that at my house! Also, congrats on the magazine.. so cool that you were featured. I now need to check out this lay baby lay blog. I really just follow yours, but now I'm just too curious as to what blog you follow haha. Such a cute lifestyle shoot! 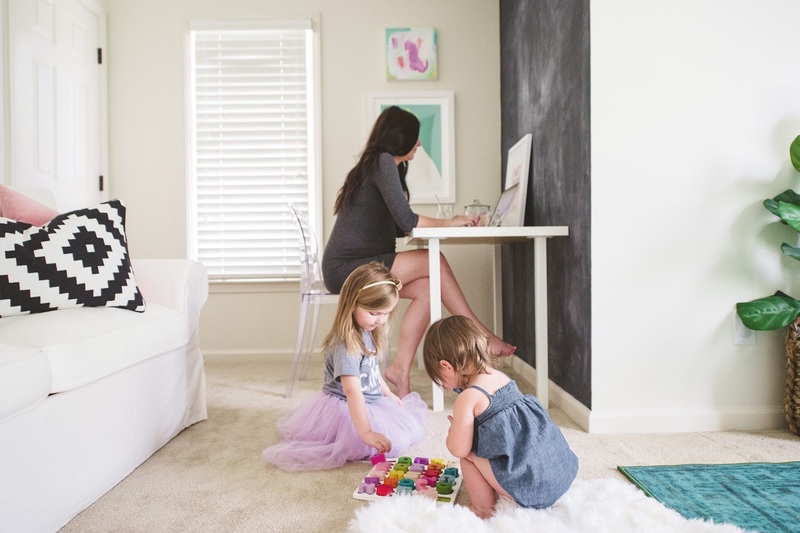 I love the idea of getting a mini family shoot done at home… ! Saw the Cupcake article. Pretty cool! I love this lifestyle shoot, so fun. Your girls are so cute! Woohoo! You are such a super mum! So sweet! 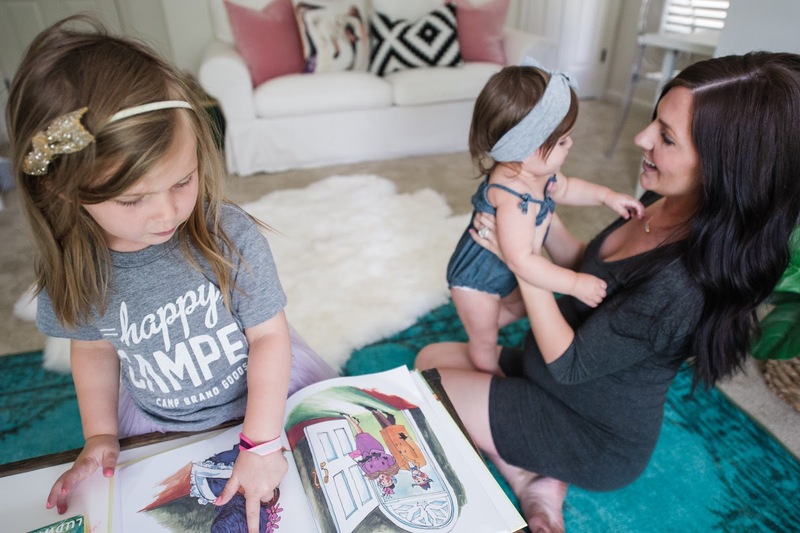 Where is her happy camper tee from? Such great photos! Have a great weekend Jessica! Your house gives me so much inspiration to redecorate! I can't wait to have kids someday so I can have a cute playroom like this. Where are those lamps from? I love the clear base. Hey Jessica! Where did you find the cute table with the baskets and the babysit books? I have just the spot for it? Thanks! Hey Jess! Sorry to be one of those twenty questions gal- buuuutttt where did you get the frame for the sweet holy molasses I love you print?! Thanks in advance and enjoy that marg! Beautiful!! What concoction are you drinking?! Looks yummy! Such inspiration in this room, thank you for sharing! As always it's nothing short of gorgeous. Where did you source the wire baskets? Our playroom is in the works and that is just what I'm looking for! Congratulations on your third little girl! We just had our fourth (a little boy) on the 4th! Love!!! How cool that you got a feature in their magazine! Your house looks so relaxing. Minted has beautiful prints! Where is that table with baskets from? I'm so in love with it!! Hey Jess. 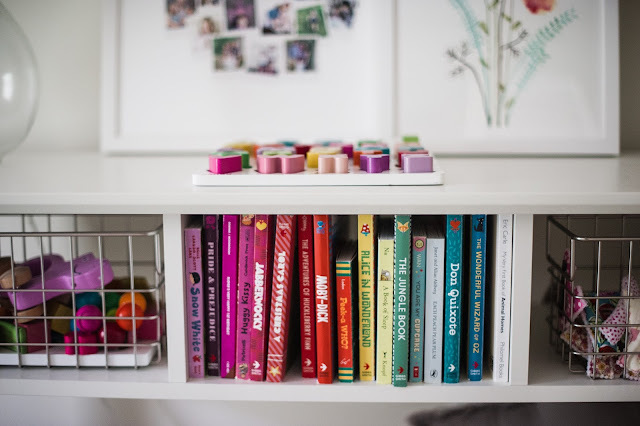 I know that you have answered a lot of questions already, but I was curious if you could share where the white table that houses the girls' babylit books is from (as well as the baskets if it doesn't come with the table). I've been looking for something to house some toys that would fit seamlessly into our current decor. Thanks lady! 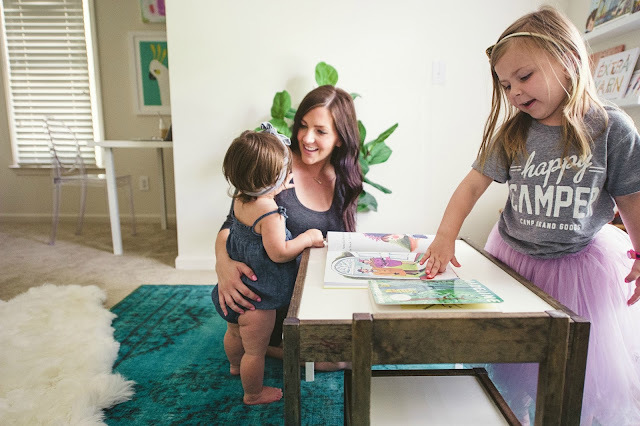 Hey Jess…..I know that you've answered a lot of questions on here, but I was wondering where you got that white table that houses the girls' babylit books, (and did those baskets come with it-if not where are they from). I am looking for something to hold some toys that will fit seamlessly into our current decor. Thanks lady!! !